SKT T1 LoL 게임단은 지난 2013 월드챔피언십(이하 롤드컵) 시즌3의 우승 기념 반지를 공개했다. SKT T1 LoL subdivision revealed the Worlds season 3’s victory commemoration ring. SKT T1 K는 작년 10월 5일 열렸던 월드챔피언십 시즌3 결승전에서 로얄 클럽 황주를 상대로 3:0 완승을 거두면서 롤드컵 우승을 차지한 바 있다. 이는 한국의 최초 롤드컵 우승이었으며, 이를 필두로 한국 선수들이 세계 전체에 LOL 최강국의 위세를 떨치게 된 계기가 됐다. SKT T1 K, at the World Championship season 3, had a complete victory against Royal Club, scoring 3 : 0 and thus winning the Worlds. This was South Korea’s very first victory and became an opportunity for Korean pro-gamers and Korea to be recognized as the strongest players and country in the world. 이번 기념반지는 라이엇게임즈에서 제작해 SK텔레콤 T1 사무국에게 전달한 것이며 이에 SK텔레콤 T1 사무국에서는 전달 시기를 고민하다가 모든 선수들이 한 자리에 모이는 명랑 운동회 자리에서 반지를 공개하기로 결정한 것으로 알려졌다. 선수단은 기념 반지를 수여받은 소감에서 “당시 우승의 경험을 잊지 않고 다음 시즌에서 반드시 최정상의 자리에 오를 것”이라며 결의를 다졌다. 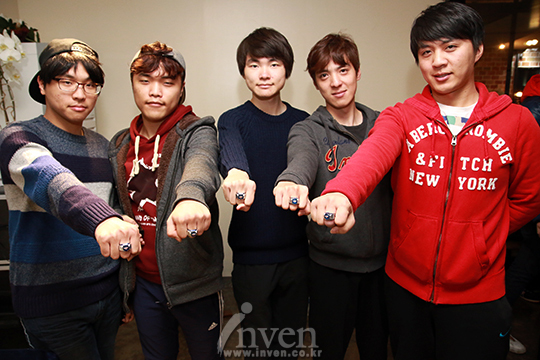 This commemoration ring was produced by Riot Games and forwarded to SK Telecom T1 office. Hereupon, while wondering about the time when to give the ring, all players were gathered at SK Telecom T1 office, in the athletic meeting place, in order to be told about the ring. The thoughts of the team while receiving the ring were: “We won’t forget this victory and we will surely go further in next season’s tournament”, showing their determination. 한편 SK텔레콤 T1은 11월 14일, 양주시 장흥면에 위치한 캠핑장에서 스타크래프트2, 리그오브레전드 종목 선수와 코칭스태프가 모두 참여하는 명랑 운동회를 진행했다. 풍선 터트리기, 꼬리잡기, 기마전, 2인3각, 피구, 족구, 축구 등의 다양한 종목을 진행한 후에 식사 자리에서 이번 기념 반지 공개가 이루어졌다. 선수들은 “평소에 운동할 기회가 없었는데 이런 기회를 만들어주신 사무국에 감사하다”라며 소감을 밝혔다. 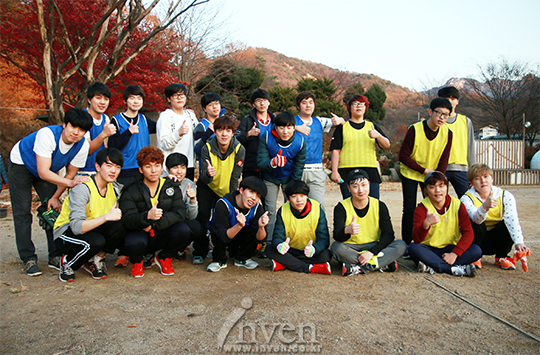 Meanwhile, SKT T1, on the 14th of November, all players from LoL and Starcraft division and coaches took part in a cheerful athletic meeting. After playing various games such as balloon burst, tail catching, cavalry battle game, three legged race, dodge ball, foot volley ball, foot ball etc. they were given the ring in the dinner room. The pro-gamers stated their thoughts on the day : we don’t have much opportunity to do some sports during the week and we are thankful to our secretariat for giving us this opportunity. Thank you for reading and again if you have any correction to suggest, please do not hesitate.